Growth Habit: Paspalum is a tough grass that can grow up to 150cm in height, however it normally grows a flattened tuft of leaves, with only the seed heads standing erect. This low growth habit helps it to survive mowing and slashing. The plant also has short rhizomes. Type of Plant: A summer growing perennial. Flowers: The tall flower stalks support 3 to 7 thin, long spikes carrying many seeds. The spikes grow horizontally outwards from the stalk. Fruit/Seed: Seed is produced in summer. Dispersal: Seeds are spread when disturbed as they stick onto clothing, wool or hair. Mowing, slashing and roadside grading operations readily transport the seeds to new areas. Distribution: Common in all Australian states in pastures, roadsides, gardens or lawns. Although occasionally used as a pasture plant on the mainland, paspalum strongly competes for nutrients with other species and has a tendency to take over. 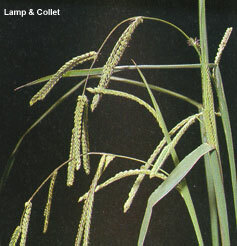 It is one of the most common grasses found on Tasmanias roadsides. Once established it is very difficult to eradicate without killing all other grasses. Grubbing (all year). For small areas- Remove entire plant. Slashing (all year). Slashing may remove seed heads but will not kill plants. Clean all equipment after slashing so paspalum seed is not spread to other areas. Cultivation (all year). Breaks up paspalum clumps. Follow up with establishment of a competitive pasture or crop. Herbicide (summer). Contact DPIWE for further information as few herbicides can kill paspalum without killing surrounding desirable grasses.